Take $5 off large bags of Plato Turkey and Pumpkin, Turkey and Sweet Potato, or Turkey and Cranberry treats 12 oz bags. DIscount given at check out. Take $6 off Plato Duck, Salmon or Organic Chicken Strips in the 14 oz size. Discount given at check out. Take $6 off the 10.5 oz size or $3 off the 4 oz bag of Plato Small Bites Training Treats. Choose from duck, salmon, or chicken. 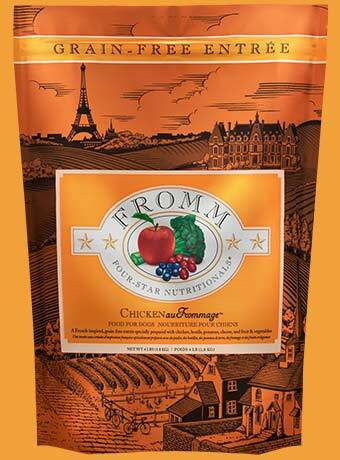 Save $3 on ANY SIZE bag of Fromm Chicken Ala Veg for Dogs. Save $3 on ANY SIZE bag of Chicken Au Frommage for dogs. Save $1 per can on Fromm Chicken Pate. Save $3 on 5# or 15# Fromm Four Star Chicken Au Frommage grain free cat food. April Special Offer from Open Farm dog food! Buy one 4.5# bag, get a second 4.5# bag FREE! Free item must be the least expensive product. Honest Kitchen Cups - $0.99 Each! The Honest Kitchen's cups are on sale for 99 cents each! Save $1 from the regular price of $1.99. Cups are a great replacement for canned food or for travel. Made in a human food facility, the ingredients are 100% human grade and wholesome for your dog. Save BIG on Open Farm dry dog food in May! Take $5 off 4.5# bags. Take $7 off 12# bags. Take $10 off 24# bags. Buy 2 Tetra packs of Open Farm wet dog food and get the third one FREE! Offer good June 1 - 30.